A child tiptoes like a ballerina towards a glittering Christmas tree, the guardian of the Christmas presents. Decorated in flittering candles and sugar sprinkled candy canes, the majestic tree enchants little Clara at midnight on Christmas Eve to come and play with her beloved Nutcracker doll. But suddenly Clara finds herself whisked away into the magical world of Christmas where she meets charming toy soldiers, beautiful snow fairies and wicked giant rats. Bravely crossing the snow frosted forests of an enchanted world, Clara strives to rescue her beloved Nutcracker from the mysterious King of Rats; only then can her dream of dancing the night away with her Nutcracker come true, and only then will she blossom into the most beautiful ballerina. 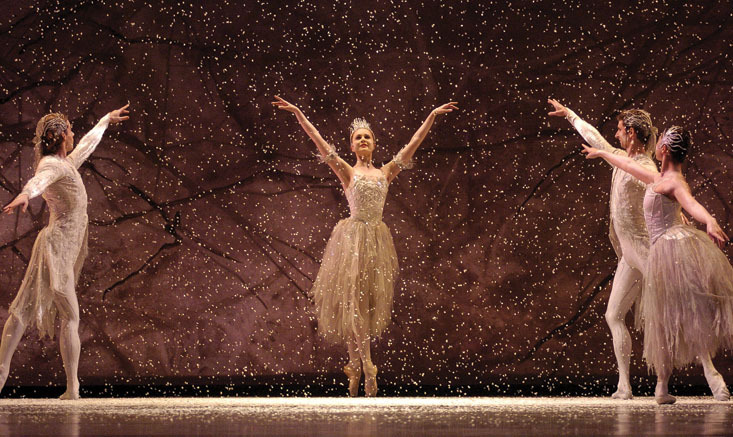 Start celebrating this magical season with this dazzling production of one of the most beautiful and captivating classical ballets of all time; Tchaikovsky’s The Nutcracker. Nothing is more spectacular than seeing your childhood Christmas fantasies leap into life in this unparalleled, world-famous production by Sir Peter Wright, complete with sets and costumes by John Macfarlane, the designer of the Company’s stunning Cinderella production. Allow your family to be charmed this holiday season by the Birmingham Royal Ballet’s breathtaking elegance and wonderment in their performance of this heartwarming Christmas story. This entry was posted in Art, Birmingham, Dance and tagged Birmingham Hippodrome, Birmingham Royal Ballet, BRB, The Nutcracker. Bookmark the permalink.